British-born director Scott on the set of his film “Man On Fire” in Mexico City in 2003. 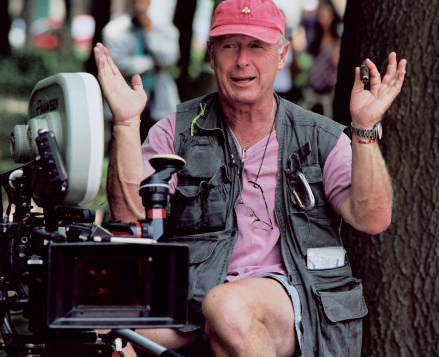 Tony Scott, director of “Top Gun,” “Days of Thunder” and “Crimson Tide,” had inoperable brain cancer, a source close to him told ABC News. The famed director died Sunday after jumping from a bridge in Los Angeles, authorities said. Police said they received a 911 call at about 12:30 p.m. that an individual had jumped off the Vincent Thomas Bridge. The body was recovered around 3 p.m., when it was identified by authorities as Scott, according to Lt. Joseph Bale of the Los Angeles County Coroner’s Office. An autopsy is scheduled to be performed today. The Coroner’s Office found several notes to loved ones in Scott’s car, a spokesman told The Associated Press. A suicide note was later found at his office, according to the AP. “I can confirm that Tony Scott has passed away. The family asks that their privacy is respected at this time,” Scott’s spokesman, Simon Halls, said in a statement, according to the AP. « Is ‘Arrow’ Star Stephen Amell Perfect for ’50 Shades of Grey’?